The Mindanao Lorikeet flies in tight formation in flocks with audible whirring of wingbeats, quite unlike any other parrot. T.j. johnstoniae: Both adults in general green; pink/red forecrown and cheeks; band from lores to occiput dark purple; yellow underparts, scalloped with green; yellow/green underwing coverts and undertail coverts; underwing band yellow. Bill orange/red. Eye ring dark grey. Eye red. 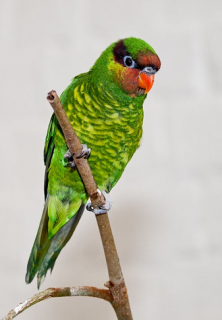 T.j. pista: Both adults darker and duller red on face; band from occiput to lores wider; upperparts darker green and underparts brighter and more vivid yellow. T.j. johnstoniae: Less pink/red on face; dull lilac/brown spot behind eye where band is in adults. Eye ring grey/white. Bill black/brown. Eye brown. Calls made in flight are continuous notes or loud, sharp sounds. Feeding is accompanied by same sharp notes or soft, twittering sounds. Enclosure 2.5 x 1 x 2m (8 x 3.3 x 6.5 ft), minimum temperature 15C (60 F). Commercial lory nectar or one homemade from honey, pollen, brewer's yeast, oat flakes, multigrain flakes, vitamins and minerals; rusk or biscuit softened in milk; fruits such as: apple, pear, orange, cactus fruits, papaya, mango; green leaves such as: Swiss chard, lettuce, kale, sowthistle, dandelion, chickweed; small amounts of sprouted millet spray. Vertical box 18cm x 18cm x 40cm (7 x 7 x 16 in). This species has historically been affected by deforestation in its very limited range. It now appears to be fairly secure in montane forest areas above 1000m (3280 ft). T.j. johnstoniae: Mounts Apo, Kitangland, Matutum and Piapayungan, C Mindanao. T.j. pistra: Mount Malindang, W Mindanao Island. Found between 1000-2500m (3280-8200 ft) in mossy montane forest, forest edge and in degraded or logged areas. Feeds on nectar, flowers, fruits, pollen and insects. Seen in pairs or small flocks. Moves altitudinally with groups of birds roosting at lower levels, moving higher during the day to feed on flowering trees and shrubs before returning to lower levels at night. 2 rounded eggs, 22.0 x 19.0mm (0.9 x 0.7 in).